Be the first to share your favorite memory, photo or story of Amanda. This memorial page is dedicated for family, friends and future generations to celebrate the life of their loved one. 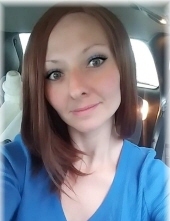 Amanda Dawn Cox Walker, age 34, of Maple Creek Road, Williamsburg, Kentucky departed this life on Sunday, March 17, 2019 at Baptist Health in Corbin. She was born on June 24, 1984 in Corbin, Kentucky to Larry and Geneva (Carpenter) Cox. She was preceded in death by her grandparents, Dillard and Litha Carpenter and Arnold and Virginia Cox. She is survived by her two children, Talon and Gavin Walker of Williamsburg, Kentucky; her mother, Geneva Cox of Williamsburg, Kentucky; her father, Larry Cox (Barbara) of Williamsburg, Kentucky; her husband, Jeff Walker of Williamsburg, Kentucky; and a host of other family and friends to mourn her passing. Visitation will be from 1:00 P.M. until the funeral hour on Tuesday, March 19, 2019 at Croley Funeral Home. The Funeral Service will be held at 3:00 P.M. Tuesday, March 19, 2019 at the Croley Funeral Home Chapel with Rev. Joe Caddell and Sister Charlotte Parks officiating. Following the Service she will be laid to rest in the Mulberry Community Church Cemetery. To send flowers or a remembrance gift to the family of Amanda Dawn (Cox) Walker, please visit our Tribute Store. "Email Address" would like to share the life celebration of Amanda Dawn (Cox) Walker. Click on the "link" to go to share a favorite memory or leave a condolence message for the family.